REVOLVER, The Beatles seventh studio album, just celebrated an impressive 50th anniversary earlier this month. Last night I sat down with my son and listened to in its entirety for the first time in many years. Growing up, REVOLVER was my very first Beatles album. It was one of two CD’s my parents owned for many years which means this is The Beatles album I am most familiar with. Because it was the first time my son Warren had heard an entire Beatles album, I decided to try my best to listen with new ears, not an easy task for an old Beatle-fan like myself. For starters, I was surprised at how clean and modern REVOLVER sounds. Sure, this type of rock music isn’t what’s in vogue today, the album could still have easily been released today. I know that this isn’t a new revelation, and is, in fact, the chief aspect that makes The Beatles and their work still so relevant. But I was still nonetheless impressed with how well REVOLVER holds up. I also noted, maybe for the first time, what a fantastic bridge album REVOLVER is between the early “Yeah, Yeah, Yeah” Beatles and the drugged out later period. The band is still trading on their moptop image/sound but there is a clear effort to craft songs that are both sonically diverse and that cover meaningful topics outside of merely wanting to hold a girl’s hand and/or being in love. There are, history tells us, several factors that contributed heavily to this evolution in the band’s sound. The first is, of course, the band’s exposure to Bob Dylan, which began a sea change in the band’s writing on RUBBER SOUL released the year before. Lennon, in particular, was increasingly trying to say more with his music thanks to Dylan’s influence. Drugs, specifically LSD, and the psychedelic counter-culture movement also played a tremendous influence on the band and REVOLVER. Lastly, I’d also say that George Harrison meeting Ravi Shankar, how expanded upon and improved Harrison’s sitar playing during the summer of 1966 also heavily influenced REVOLVER. REVOLVER might also best be described as Harrison’s coming out party. Though his best Beatles-era songs are arguably on ABBEY ROAD, I would argue that it is REVOLVER where it becomes apparent that Harrison is just as good a songwriter as Lennon-McCartney. It’s worth noting that this is the first (and only) time that a Harrison-penned song opens a Beatles album. And what an interesting choice “Taxman” is when you consider the song’s subject matter. This is the first time The Beatles get political and it’s not about war but rather their pocketbooks! I’m not sure I would be aware of the tax situation in the UK during this period of history were in not for this song and The Rolling Stones eventual decision to be tax exiles during the recording of EXILE ON MAIN ST. Interestingly enough, unlike many protest/political songs of the era, “Taxman” is probably the closest song to remain topical even to listeners today. Though largely considered to be the pop Beatle, the one with the keenest commercial sensibilities, even Paul McCartney gets serious on REVOLVER. True, McCartney (like Lennon) had been maturing in his songwriting with each successive album, REVOLVER features one of his darkest songs ever, “Eleanor Rigby.” Though the song was written in conjunction with Lennon, who often gets credit for being the more artistically-serious Beatle, McCartney came up with the impetus for the song. Listening to “Eleanor Rigby” with fresh ears, I was struck at how hopeless the song’s characters are. That McCartney, a wealthy young rock star, would write such a sensitive song about ordinary, lonely people is still surprising to me. Though the similarly melancholy ballad “Yesterday” gets the lion’s share of accolades, I think “Eleanor Rigby” is the better song. The arrangement is more complicated and the lyrics are more evocative. Without devolving into a simplistic story-song, “Eleanor Rigby” manages to paint the listener a few sad vignettes that cut to the very heart of loneliness and the plight of people society at large has forgotten about. Sure, the song is a bit dramatic, perhaps even a bit melodramatic, but I still get chills listening to the track’s mournful strings. The Beatles dipped their toes into psychedelic music with “I’m Only Sleeping.” A John Lennon song about the joys of staying in bed, the song features reversed or “backward” guitar tracks, a touchstone of psychedelic music, and has an overall druggy feel to it. The song is one of the few Beatles songs that feature an explicit outsider perspective (“I’m a Loser” might be considered a proto-outsider song, “The Fool on the Hill” is a notable example, as is “You’ve Got To Hide Your Love Away”). Was the world judging Lennon because all he wanted to do was sleep or is the song really about drugs (like most things)? It’s difficult to say. During this period Lennon did reportedly enjoy getting high and staying in bed, but I’ve also read that McCartney had to frequently rouse his writing partner from bed before working on their songs. Also worth noting, the interview Lennon gave around this time in which he famously declared The Beatles “bigger than Jesus” was part of an article that contains a quote from a friend of Lennon’s who declared him the “laziest man in England.” So perhaps “I’m Only Sleeping” really is just about napping in bed. Either way, the song’s inventive use of studio trickery was foreshadowing to surreal sounds the band would capture later on REVOLVER (and in their subsequent albums). “Love You To” is Harrison’s best song on REVOLVER and one of the most daring songs the band ever produced. Though he’d used the sitar on RUBBER SOUL, to great effect on “Norwegian Wood,” it was this track where Harrison truly brought Indian music to the band’s sound. Using a sitar, a tabla (hand drum), tanpura (a special rhythm instrument), and Harrison created a sound that no doubt sounded otherworldly to the majority of Western listeners of the time. Besides launching a whole new phase of the band’s creative life, “Love You To” single-handedly popularized the genre of World Music. A mix of philosophical noodling and romantic love, the track was the undoubtedly the most sexual song the band had recorded up to that point. Harrison repeatedly states “I’ll make love to you/if you want me to” in the chorus of the song. Another key influence on The Beatles was Beach Boy Brian Wilson, who’s ghost is all over McCartney’s “Here, There and Everywhere.” The most obvious Wilson-trademark found in the song are the ethereal backing vocals. But the core of the song, being in love and having that love make you a better person is almost a reflection of the themes found in Wilson’s own “God Only Knows.” Though the songs were written and recorded around the same time, this can’t be accidental, can it? A more nuanced and mature love song, “Here, There and Everywhere” takes a larger view of the impact of romantic love beyond the early pleasures of love’s first blush (like most early Beatles love songs). The track is less about how love makes one feel and more about the impact love has on one’s outlook. I think that this song is probably a better example of The Beatles doing a Beach Boys-esque song than “Back in the USSR,” which is just straight parody. The song is nothing but further proof that the band didn’t exist in a vacuum and took cues from the work their peers (besides Dylan). I can’t tell you how crushed I was when I first learned that “Yellow Submarine” wasn’t actually written by Ringo. The rule for 99.999% of Beatles songs is that whoever is singing lead wrote the track. Sadly, Ringo only wrote two songs during his time with The Beatles, “Don’t Pass Me By” and “Octopus’s Garden.” The song is a fanciful kiddie track that began life as McCartney trying to write both a song for Ringo to sing and a Donovan-esque number. To McCartney’s credit, even though the song is pretty much nonsense, it works wonderfully with Ringo at the helm (pun intended). That this song would later go on to inspire a super-trippy animated film is just icing on the cake. I’d like to hear McCartney sing this one, though I have a hard time imagining what that would be like. It’s odd that two of Ringo’s best known Beatles songs involve the ocean, but then again England is an island and Liverpool is a port city so I suppose it’s not so odd that the boys would have a healthy interest in the sea. I love the song’s goofy little extras, like the crashing wave sound and the ringing bell. Ringo play-acting as a sailor in between verses is also a really nice touch that adds to the song’s theatrical, almost pop-up book-like quality. The Beatles dabbled in so many genres that I guess it shouldn’t be surprising that they ventured into kids music. “She Said She Said” and “And Your Bird Can Sing” are both ostensibly a dialogue taking place between a man (Lennon) and a woman. “She Said She Said” has a real druggy (acid?) feel to it in which neither party can properly connect or articulate a feeling that they are having. Though the “I know what it’s like to be dead” is definitely the proclamation of chemically altered mind, “I know what it is to be sad” is very real thought/feeling. The juxtaposition between the two has always fascinated me. Is the communication breakdown between the two parties the result of drugs or gender? Who can say? Further complicating matters are the fact that the song was inspired by Henry Fonda, who famously told Lennon at a party “I know what it’s like to be dead.” The song pairs nicely with “And Your Bird Can Sing” which is an indictment against materialism over a personal connection. Both songs share an awesome, iconic opening guitar riff (though “And Your Bird Can Sing” edges out “She Said She Said” in this department). In his book All We Are Saying, author David Sheff quotes Lennon as being dismissive of the song, essentially calling it all style and no substance. I disagree and think Lennon was doing what Lennon often did and disparaged his older work in favor of whatever thing he was doing at the time. The I’ve always really enjoyed the line “You say you’ve seen Seven Wonders/and your bird is green.” That image always stuck with me and I picked up on that line again when I re-listened to the record. Similarly, “Good Day Sunshine” and “Got to Get You Into My Life” are very similar McCartney tracks that feel almost like throwbacks to a quainter, simpler time. “Good Day Sunshine” has a very old-timey feel to it, both in its simplicity and with it’s twinkling piano and optimism. In fact, the track wouldn’t be entirely out of place on The Kinks magnum opus VILLAGE GREEN PRESERVATION SOCIETY. The shining horns on “Got to Get You Into My Life” has a similar effect, though “Got to Get You Into My Life” features a much rougher-sounding vocal performance from McCartney. It’s almost an R&B song and was famously covered by Earth, Wind, & Fire in 1978, so apparently I’m not the only one to pick up on this fact. Paul McCartney has gone on the record to state that “Got to Get You Into My Life” is about marijuana, which I find both perplexing and oddly satisfying. Both tracks share a youthful optimism and exuberance that an older version of the band probably couldn’t pull off. McCartney would later revisit this type of old-fashioned/throwback on The White Album (“Martha My Dear” and “Ob-La-Di, Ob-La-Da”) with diminished results. “For No One” is one of the band’s most poignant and bare-bones songs. Detailing the end of a relationship, Paul McCartney’s song perfectly captures the sadness one feels when you realize the love is gone. Tastefully understated, the song is memorable for its achingly sad french horn solo near the end. The line “a love that should have lasted years” sounds less accusatory the older I get, which I get is an outside quality that I am bringing to the song. And yet, part of me can’t help but think that McCartney’s choice of words aid this phenomenon by being just a touch vague enough to avoid implying fault on either party. Even Lennon, who could be McCartney’s toughest critic, was a fan of “For No One.” Again, this is another track that lives in the shadow of “Yesterday,” even though I think it does essentially the same thing but better. Much like “Got to Get You Into My Life,” the song “Dr. Robert” was about drugs. Though the latter was more obviously about drugs than the former, it’s still a bit of a secret drug song. A bit cornball in comparison to many of the band’s other drug songs, “Dr. Robert” is important because it’s ostensibly about the doctor that supplied the band with their first acid trip (a dentist who laced the band’s coffee with the drug after dinner one evening). This track is most notable (in my opinion) for the almost hypnotic quality applied to the lyrics”well, well well you’re feeling fine.” Despite not being as colorful as the band’s later substance songs, this one key feature of the song puts above most other songs of a similar theme recorded by other artists at the time. The last Harrison-penned song on REVOLVER, “I Want To Tell You” is almost a rallying cry for his creativity. While not exactly stifled, Harrison also didn’t receive the full support of McCartney and Lennon when it came to his songs. “I Want To Tell You” is all about having a tremendous torrent of things to say and the struggle with which Harrison (and really all of us) have trying to express ourselves. There’s a dash of mysticism running through the song, no doubt an influence from his intense studying of all things Eastern. “I Want To Tell You” is a great song because even though it covers a very heady, intellectual topic, the song is still very humble in its presentation (almost low-key in many respects). While not Harrison’s best song, I’d say it was the most emblematic of who he was as an artist and as an individual: highly intellectual with a down-to-earth quality, mystical with an aura of practicality. The final track on the album is also the best. “Tomorrow Never Knows” is a tour de force and easily in my top 5 of all-time Beatles songs. Everything about this song is crafted perfectly, from the odd effect place on Lennon’s vocals to the Indian-influenced drum pattern that Ringo uses. “Tomorrow Never Knows” is probably the first truly great studio track from a band that would soon go on to do nothing but fantastic studio-driven tracks. Using looping tape, The Beatles create an otherworldly soundscape that must have scared the crap out of all the kids tripping on acid the first time they put REVOLVER on. That this is the track to close the album makes the songs feel like an odd, beautiful sunset. The strange, mystical poetry of Lennon’s lyrics are as just a good as anything the man ever wrote. I’m sure this song is highly regarded, but I feel like his later works like “Lucy in the Sky With Diamonds” and “Strawberry Fields Forever” are more lauded. And I find that sad in a way, because “Tomorrow Never Knows” is easily the equal of both of those tracks. Perhaps I don’t run in the right crowds, but I feel like REVOLVER is almost a forgotten masterpiece by The Beatles. RUBBER SOUL is usually the transitional Beatles record that gets the most attention, which is a shame because I think REVOLVER is the superior album. Straddling the line perfectly between both periods of the band’s creative life, REVOLVER has everything one thinks of when they think of The Beatles. Like coffee, Steely Dan is a bit of an acquired taste. I grew up in a household where, for a few years, there were only two CD’s in the house: The Beatles REVOLVER and A DECADE OF STEELY DAN. That greatest hits compilation gathered quite a bit of dust. The appeal of a band like The Beatles is instant and able to transcend age and experience. The appeal of a band like Steely Dan is…a bit more complicated. To be fair, I never gave Steely Dan more than a causal listen before casting them off as “lame.” I must say, the band has a certain reputation among rock fans, many write them off as “dad rock”, self-indulgent, and worst of all: boring. One of my all-time favorite comedians, George Carlin, even has a pretty funny joke that has the lameness of the band’s fans as part of it’s punchline. Another factor at play in my inability to fully enjoy Steely Dan was my own ignorance of jazz. 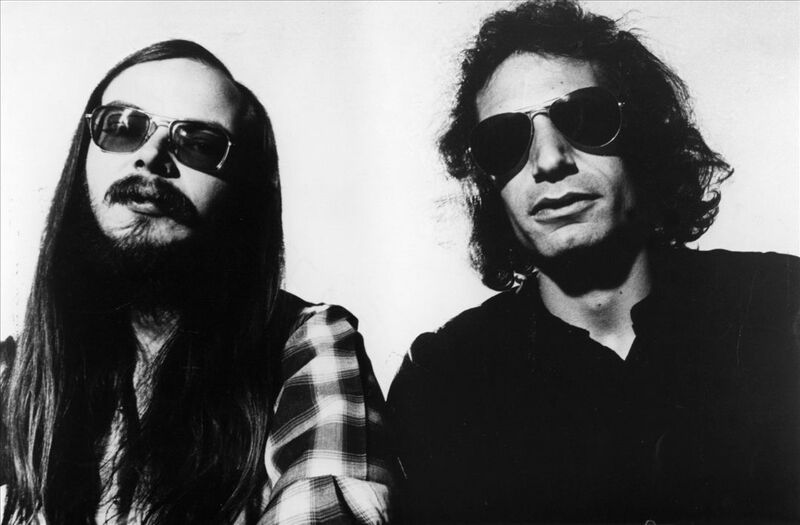 Steely Dan, unlike most rock bands, are more jazz-influenced than they are blues-influenced. Jazz is a funny thing, and like coffee (and Steely Dan) a bit of an acquired taste. And so, I remained ignorant of the greatness of Steely Dan until my second-to-last year of college. I was driving home from school one autumn afternoon when I heard “Reelin’ In The Years” on the local classic rock radio station. I’m sure I’d heard it before, but I must not have been ready because that afternoon I was struck-dumb by the song. “Reelin’ In The Years” is awesome for two reasons: the blazing guitar work and the incredible delivery of the lyrics. The guitar work is exceptional, so much so that guitar god Jimmy Page has been quoted as saying that the guitar solo in “Reeling In The Years” is his all-time favorite solo. That’s mighty praise. Singer Donald Fagen has gone on to sort of roll his eyes when it comes to the song, calling it “Dumb but effective.” And I guess it’s effective, like a shotgun’s effective when fired within a foot of it’s target. To be fair, “Reelin’ In The Years” is a great blunderbuss of a song compared to the more nuanced work Steely Dan produced over their long run. I guess the fact that it’s more of a straight-up rocker is part of the reason it’s the most-played Steely Dan song on classic radio today. “Reelin’ In The Years” would be an noteworthy if all it consisted of was Elliott Randall’s out-of-this-world solo-but then there are the song’s lyrics, which perfectly match the quality of the guitar work. Like all of Steely Dan’s best songs, “Reelin’ In The Years” is equal parts bitter and wistful. “Reelin’ In The Years” is accusatory and at the same time filled with a sad-sort of desperation. 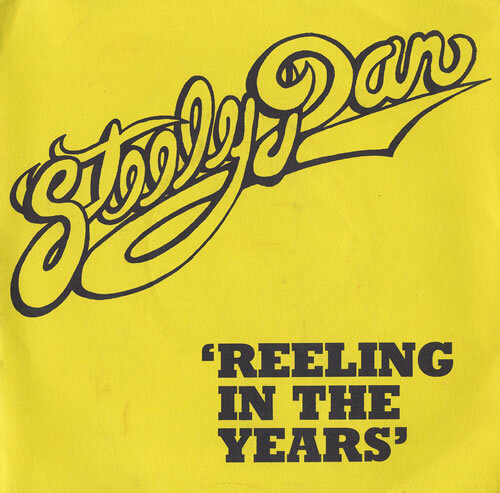 Steely Dan’s lyrics are famously opaque, but on “Reelin’ In The Years” the band is a bit more on-the-nose obvious than usual, without the usual literary flair or West Coast double-talk found in most of their songs. I think that’s another reason why the song is so popular on classic rock radio: it doesn’t take a PhD in English to figure out what the hell the song is about. Admittedly not the coolest dudes in rock. All the best lyrics in the world don’t mean anything if the delivery is off, though. The lyrics, though a bit dumbed-down as far as Steely Dan songs go, are delivered spectacularly. They come come fast and furious. There’s so much venom in Fagen’s voice as he spits the words out, his voice barely keeping up with the wailing guitar. The amount of information, the sheer volume of emotion and narrative conveyed so perfectly and so quickly it’s downright Dylan-esque. The song ended and I switched off the radio. I went home and got online and started reading about the band, trying to figure out which album I was going to buy first. A month later I went back home to visit my parents, before I left I found that dusty copy of A DECADE OF STEELY DAN. Without asking, I slipped the album into my duffle bag and have never looked back. I never thought I’d be a Steely Dan fan, but I am.